Payroll Mate® makes running payroll for a dry cleaner easy and affordable. Our payroll system offers many features that can cater to the special payroll processing needs of a Dry Cleaner. Payroll Mate® allows you to custom create income types such as per piece to ensure you can accurately handle your employee's payroll. Pay cleaners, customer service representatives, laundry pressers, clothing ironers, folders, launderers and washers. It is a tough job to run a dry cleaning business as you will constantly have to advertise, work with clients, and make sure you keep things in financial order. You are in luck as Payroll Mate® is a great program, and you will have no issue in administering your payroll as you have a program that can assist you with it all. With this solution, you can concentrate on running your dry cleaning business, bring in more clients, and make sure that all of your employees are paid in a timely manner. • Payroll Mate® includes an easy to following Getting Started Guide as well as step by step wizards to follow to get the program started. • If you have a problem with anything including adding employees or other tasks, you can access the built in tutorials which are very detailed and will help you through the process. • Of course, there are multiple ways to get friendly customer service including chat, email and phone support. • Payroll Mate® is compatible with many operating systems. These operating systems include: Windows Vista, Windows 7, 8, and 10. If you are a Mac fan, you don’t have to worry as you can easily use virtualization technology so you can use this great program. • Payroll Mate® supports up to 10 companies with 75 employees each company and automatically calculates State and Federal withholdings, Social Security, Medicare, and the net pay. • This program supports Federal forms, W-2, W-3, 940, 941, 943, and 944. • Payroll reports are included which insures all information is easy to access. Some of these reports include Employee Lists, Employee Earnings Total, Deposit Requirements, State Taxes, and many more. • Signature ready checks can be easily printed once your employees are paid. Pay stubs can also be printed and emailed if necessary. 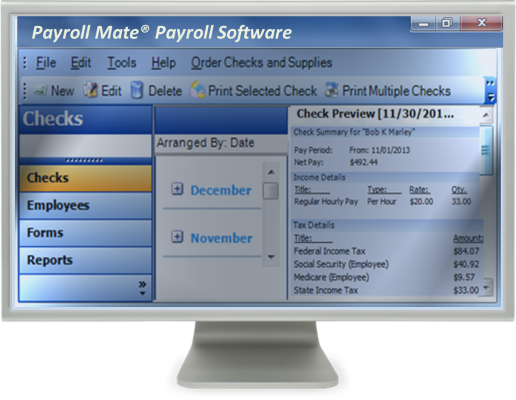 • Payroll Mate® is easily customizable. You will never have to worry about whether or not the program has the tax, income, or deduction categories that you need since you have the ability to custom create your own. Do you have employees that are required to pay a certain local tax? No problem. This can easily be custom created and applied to your employees. A variety of pay frequencies and pay types are included. Pay frequencies include daily, weekly, bi-weekly, semi-monthly, and monthly. Do you have both hourly and employees that are paid per piece? No problem. The program offers many income types and the ability to custom create your own. Payroll Mate® allows you to deal with any type of deductions needed including child support, 401K, health insurance, and many more. Vacation or sick time can be accrued by per check or per total hours on the payroll check. Sick or vacation hour balances can easily be printed on employee’s pay stubs. • Payroll Mate® is reliable and secure. Simple backup and restore features are available so you can ensure you never lose any pertinent employee data. Are you concerned with keeping your employee’s information safe? If so, you can set a password for login. You can also mask Social Security numbers on the printed pay stubs. • Do you pay vendors or independent contractors? If so, this can be handled with Payroll Mate® by purchasing an additional cost add-on feature. If you run a dry cleaning company, you will want to take advantage of the best payroll solution available. No matter what your payroll entails, Payroll Mate® can assist you. Payroll Mate® makes processing payroll simple so you still have the time you need to successfully run your dry cleaning business.